The Autorite Garante della Concorrenza e del Mercato (AGCM), Italy's official authority on marketing and advertising issues, previously ruled that Apple and Samsung are both guilty of pressing users to update software without acknowledging that this affects the performance of older phones. 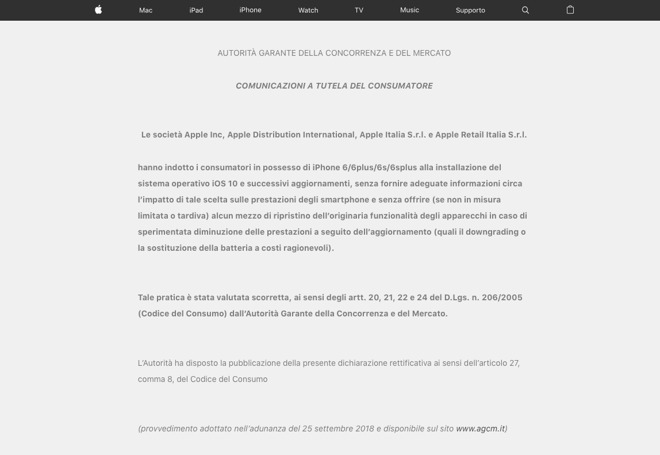 It has now required Apple's Italian site to display a notice to this effect on its homepage. The notice is at the very bottom of Apple's front page and comes with no additional comment from Apple. It's described as "dichiarazione rettificativa", an amending declaration, and states that Apple led iPhone 6, iPhone 6 Plus, iPhone 6s, and iPhone 6s Plus phones to update to iOS 10.2.1 and later with no information about the performance impact. It also says that Apple gave no means for users to restore the original performance at the time, although it has since. The AGCM originally fined Apple the equivalent of $11.4 million and Samsung $5.7 million in October 2018. The news of this homepage requirement was first reported by setteBIT on Twitter. It's not known yet how long Apple is required to display this notice. Reportedly, Samsung has been ordered to display a similar notice, but at time of writing there is no equivalent on Samsung's Italian homepage. Apple has previously apologized for making the decision to throttle iPhones with worn batteries, with the intention of preventing performance issues. 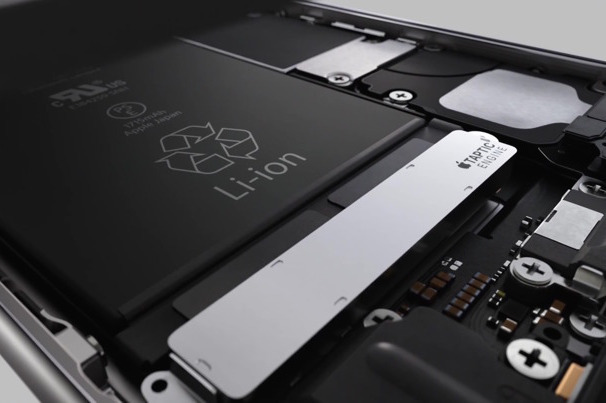 Introduced with the iPhone 6, iPhone 6s and iPhone SE in 2016, Apple cited lithium-ion batteries becoming "less capable of supplying peak current demands" in cold conditions and having "a low battery charge" as they age, which can cause iPhones to unexpectedly shut down. In response to consumer complaints, Apple reduced the cost of the out-of-warranty battery replacements from $79 to $29, then later issued an iOS software update with Battery Health options. The $29 battery replacement program has since expired.